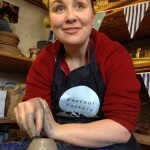 Making a pot on the potter’s wheel is one of those ‘I’ve always wanted to do’ activities. This fun session offers the opportunity to do just that! 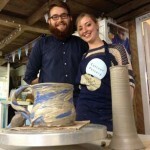 Perfect for individuals, couples and small groups wanting to get creative with clay. 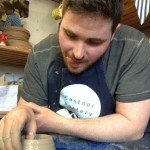 Create a bowl or vase on the potter’s wheel under the expert guidance of one of our in-house potter’s wheel experts. Not only do you get to wrestle a lump of spinning mud but you also, quite literally ‘PAINT YOUR OWN’ creation afterwards. Leave it with us for a month to dry, fire and glaze and we’ll drop you a line to let you know it’s emerged from the kiln and ready for collection from the Pottery. P+P can be arranged at £5 per item. 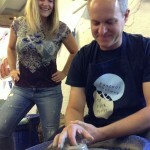 There are no mistakes in pottery – just happy accidents and learning experiences. The positive, inclusive nature of the instruction means everybody can join in the fun and achieve amazing results. City breaks, rural retreats and weekends away are becoming increasingly popular with couples and individuals wanting to get away. If you ever have the good fortune to find yourself in the beautiful county of Herefordshire, make sure you don’t leave before making a pot on the wheel at Eastnor Pottery. 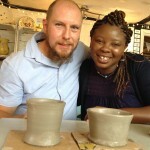 POTTERY is the traditional 9th wedding anniversary gift. 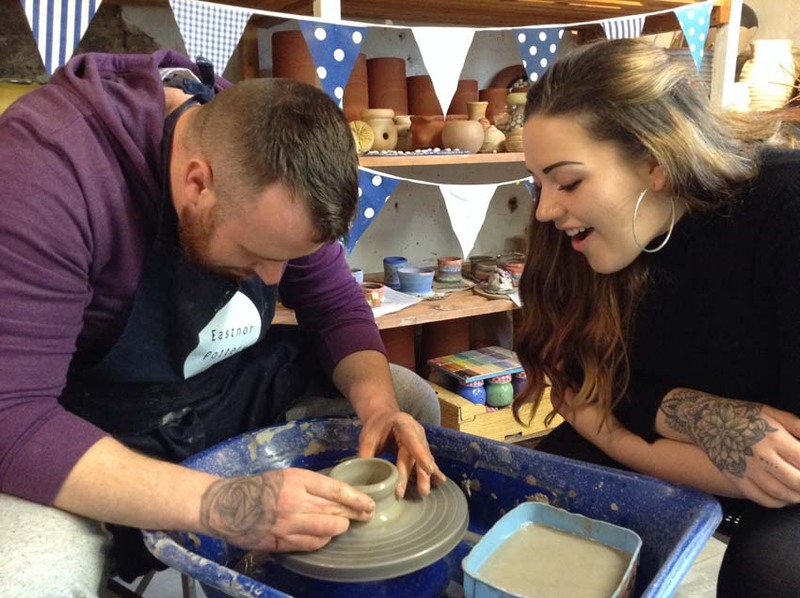 Why not take it one step further and make each other a clay pot on the potter’s wheel to mark the occasion. On arrival you will be guaranteed a warm welcome and a nice complimentary cuppa (fresh coffee or select from our range of specialty teas) You’ll then meet your fellow pottery participants. (We limit the group size to ensure maximum one to one attention.) Once you’ve all had the chance to get to know each other a little better, you’ll be offered an apron and settle down to watch a potter’s wheel demonstration from your designated professional potter. Then it’s down to business. You’ll each take a turn to make a pot on the wheel. Your expert potter is sat wheel side throughout the experience, gently talking and guiding you through the five steps to making a pot. You certainly won’t be bored waiting your turn as the activity makes for a great spectator sport. You’ll have so much fun watching each other, all the time picking up handy tips from your instructor. At this point, you can turn your pot into a mug or jug by adding a handle. You might even consider adding modeled decoration. This costs an additional £10. Once all members of your group have a ‘creation’ to show for their efforts, you’ll be shown to a painting table to decorate your freshly thrown masterpiece in coloured under-glazes. The whole experience lasts between 1.5 – 2hrs depending how creative you get with the paints! Your pot will need to dry before it’s fired and glazed. This process takes about a month, after which your fabulous ceramic item will be available for collection from the Pottery. P+P can be arranged at £5 per item. Why not try our ‘fun size’ lump of clay – perfect for young potters! £30. Why not ‘super-size’ with a large lump. £50. Pre-booking essential! 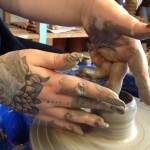 Simply contact the Pottery to check availability and book your session. We are open Tuesday – Saturday 10am – 4pm and have sessions starting at 10am, 11.30am, 1.30pm and 3pm. Sundays and evenings may be available for larger groups. Looking for somewhere to stay? 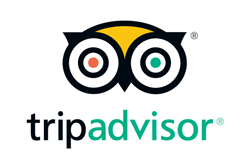 Please take a look at our list of accommodation providers.